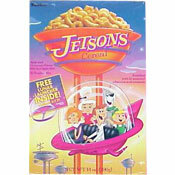 Jetsons Cereal was described on the box as having "apple and cinnamon flavor with real apple bits". The multi-grain cereal pieces were shaped like moons, stars and rocket ships. The cereal hit shelves the same year that Jetsons: The Movie hit theaters. Ralston seemed to be banking on a renewed popularity in the famous cartoon family that had been around since 1962. Unfortunately, Jetsons Cereal never caught on. In a New York Times article the following year, William P. Stiritz, the then-chairmen of Ralton Purina, was attributed as referring to Jetsons Cereal and Hot Wheels Cereal (which came out the same time) as "flops". The Jetsons were created by Hanna-Barbera Productions in the early 1960s. The animated prime-time television series, The Jetsons aired on ABC from September 1962 to March 1963. The Jetsons popularity grew over the next two decades thanks to constant airings on Saturday morning TV. This lead Hanna-Barbera to produce more episodes of the show between 1985 and and 1988. 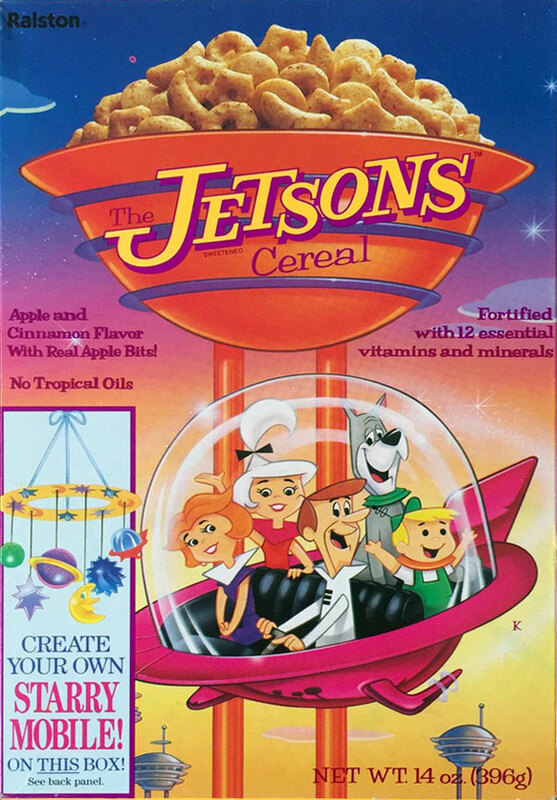 The first 9 ingredients listed for Jetsons Cereal were wheat flour, oat flour, corn flour, rice flour, sugar, dried apple pieces, corn syrup, malt and partially hydrogenated vegetable oil. 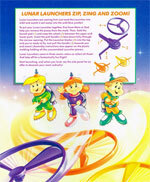 Known premiums in Jetsons cereal: glow-in-the-dark galactic stickers, galaxy gliders, lunar launchers and an offer to win a free trip to U.S. Space Camp. Click here to see all cereals from Ralston. What do you think of Jetsons? 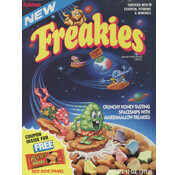 Another cereal I didn't try in the early 90's. Not sure how I missed this one. I watched the Jetsons all of the time. Sounds like it was a good cereal. I was in love with this cereal... pretty much any cereal with cinnamon really.